If her series were called "Romeo and Juliet," Kirisaki Chitoge would be Juliet… except that she is an unladylike and short-tempered daughter of a mafia boss. Not to mention her knack for misunderstanding things. 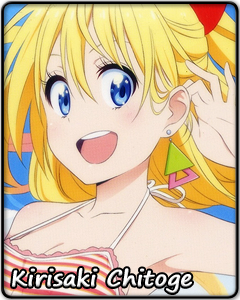 But while she does not fit the mold of the famous character, that does not stop Chitoge from aiming for that ideal. Living with the mafia means not staying in one spot for too long, so Chitoge always has too little time to associate with others, get to know them better, and have fun together. But Chitoge will not give up so easily – she keeps a diary about all of her classmates so that she can relate to them to the best of her ability. What is wrong with wanting to fit in? Chitoge strives to be relatable to her peers, molding herself to fit the world around her. What do people talk about when they go shopping? What is the correct thing to buy when helping a friend buy a present? What is the best advice to give to someone who wants to confess his or her love? These are some of the questions Chitoge seeks an answer for. Chitoge is shocked, though, when the most valuable advice comes from an enemy: she can act like herself, and people will still accept her for who she is. And so, Chitoge tries something new: staying true to herself and her feelings. In this story about false love, Chitoge searches for a special key. She hopes the door it opens will lead her to a love from her past, but also to her own heart. Then again, the quickest way to make a long story short is to say those three magic words. How hard can it be?